5 August 2006 / Books / Detroit, i.e. Detroit, i.e. is a group of Detroit-based artists, writers, designers, and architects. 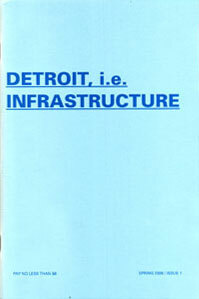 'Infrastructure', the first issue of 'Detroit, i.e. ', is a collaborative project with Museum of Contemporary Art Detroit.